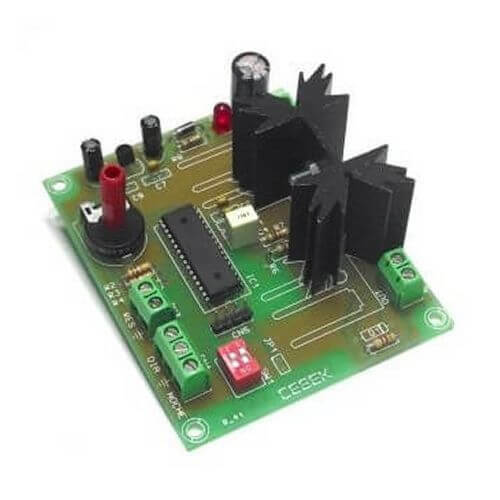 12Vdc, 4 Amps Dusk/Dawn Effect Lighting Controller Module that progressively adjusts lighting brightness over a user set time period to mimic either sunrise / day (Day Effect) or sunset \ night (Night Effect). The two operating modes (Day Effect/Night Effect) provide a progressive regulation of the output voltage from completely Off-to-On or On-to-Off. The length of time for the Dawn/Dusk part of the cycle is user adjustable between 1 Second and 120 Minutes thus providing a gradual transition in lighting intensity. The Day/Night Effect input (simple contact closure) allows the user to switch the unit between the Day or Night cycles. Activating the Day Effect input will initiate the sunrise/day cycle. It will remain in the "day" state (fully on) indefinitely. Releasing the Day Effect input and activating the Night Effect input will initiate the sunset/night cycle. It will then remain in the "night" state (fully off) indefinitely or until the Day Effect is initiated. The Day/Night Effect input can be connected to the relay output of a cyclical timer (e.g. CI010/11/12 or CI110/11/12, 3141 or 1180) for automatic and continuous switching between Day and Night cycles with quiescent adjustable times provided by the timer to produce a cyclical virtual day effect. Useful in a variety of applications including poultry-farming, design studios, security and safety lighting and children's bedrooms. The module is supplied fully assembled and has an onboard safety fuse and LED 'On' indicator. All you need to do is house it in a suitable enclosure, add the wiring, switches and lights. Suitable for use with conventional incandescent filament light bulbs and 12V LED strips only. NOT SUITABLE for use with inductive loads e.g. LED bulbs, transformers, etc. A mains version of this product is available, Order Code CR011.